2nd Generation Intel Core i7. As predicted, Apple has just released its new MacBook Pro 15 Early 2011 with Intel Core i7-2635QM, AMD Radeon HD 6490M and matte hi-res display and we got a hold of one to review. Is this multimedia wolf in sheep's clothing worth the price? It's been rumored that a new generation of MacBook Pro laptops was coming out for months before the announcement. About 10 months since the last update—the typical interval—Apple revamped the entire series with new hardware. These laptops are not affected by Intel's series 6 chipset defect (Cougar Point) thanks to their new chip with B3-Stepping. 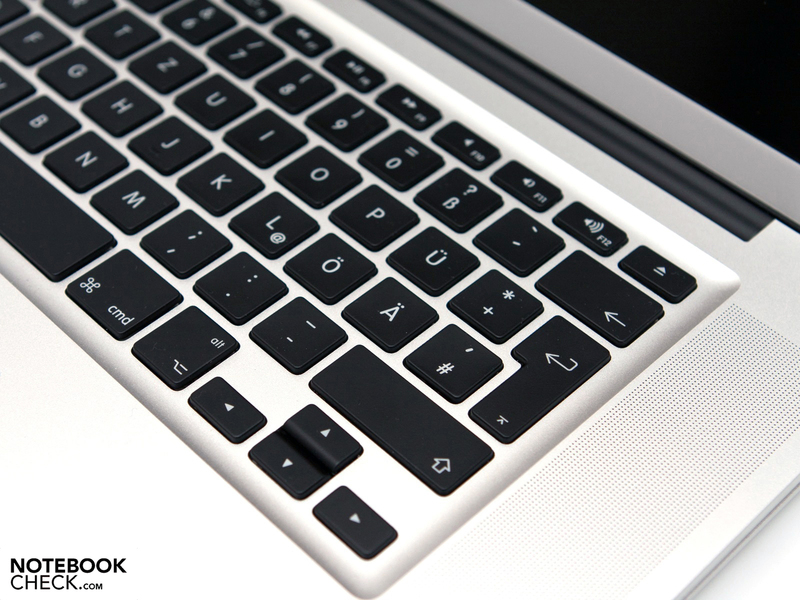 The company has stuck with the aluminium unibody case design and kept the same keyboard and trackpad in place. Since this is already the fourth generation to use this same case design, we've left the sections "Case" and "Input Devices" out of this review. 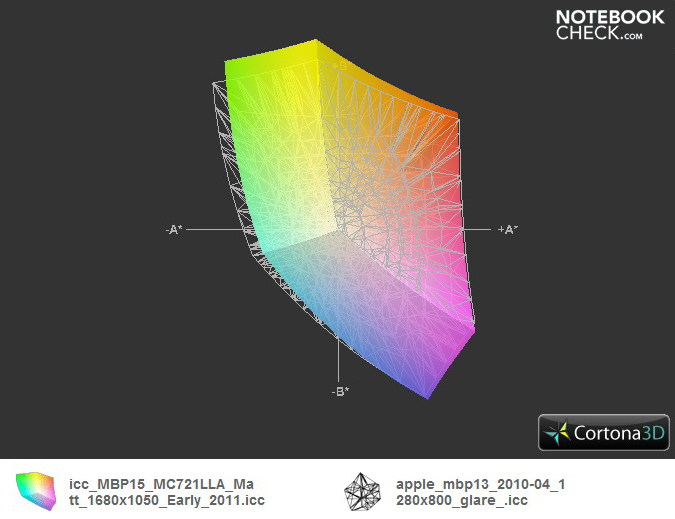 Please refer to the Apple MacBook Pro 15-inch i7 2010-04 (Mid 2010) review for a discussion of those sections. The 15" MacBook Pro of the Early 2011 release comes with your choice of three different processors and two dedicated graphics cards. 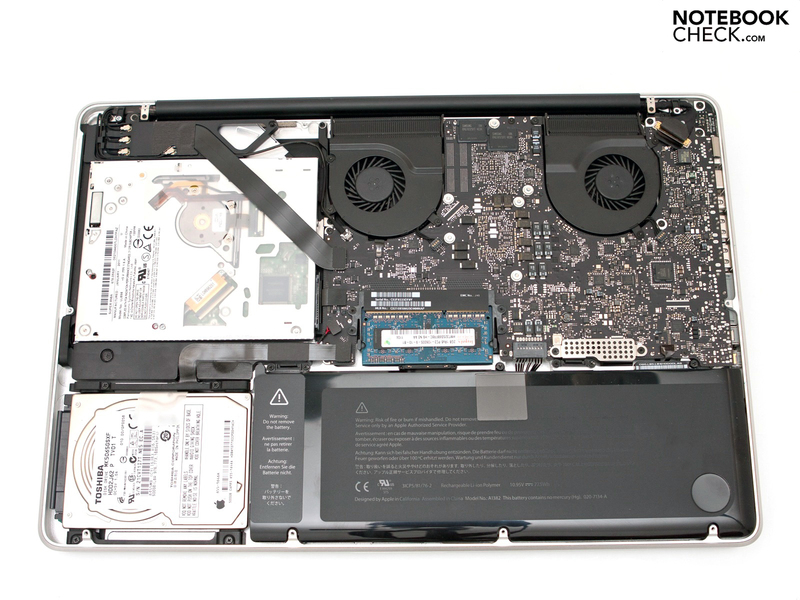 We chose to tinker with the starter model, equipped with an Intel Core i7-2635QM quad-core CPU. 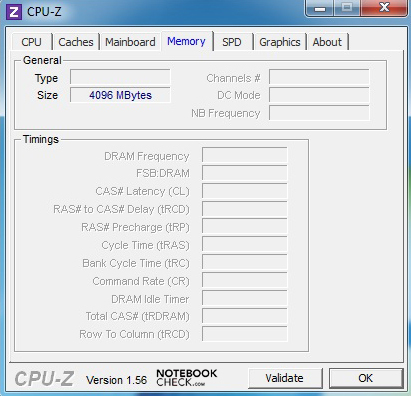 The processor runs a base clock rate of 2.0 GHz. Thanks to Turbo Boost 2.0, the CPU can theoretically be overclocked up to 2.9 GHz. The graphics cards in place in our test model are the on-board Intel GMA HD 3000 as well as the dedicated AMD Radeon HD 6490M with 256 MB GDDR5-RAM. Depending on the level of stress on the system, it automatically switches between these two graphics cards. There are also some options when it comes to the display. For an additional price, Apple offers a hi-res display (the one we reviewed) with a native resolution of 1680 x 1050 pixels and a matte screen. The typical glossy screens still come standard and have a resolution of 1440 x 900 pixels (review coming soon) or 1680 x 1050 pixels (100 Euro extra). You can always customize the other features via the Apple Store. Besides the standard 500 GB hard drive and 4 GB DDR3-10600 RAM (1333 MHz), there are options at your disposal for 8 GB RAM, larger hard drives, solid state drives (SDD) as well as various accessories. The starting price for the Apple MacBook Pro 15 Early 2011 is 1749 Euro (RRP), while the model we reviewed (matte screen) starts at 1899 Euro (RRP). Among many other tough decisions, in this review we discuss for whom the hi-res display might be worth the higher price. Apple has kept just about the same set of ports for connecting peripheral devices. These include the MagSafe power connector, an RJ-45 Ethernet port, FireWire 800, two USB 2.0 ports and a headphone jack. There are however two novel aspects about the ports available. One, the SD card reader now supports the current SDXC standard. And two, Apple is the first manufacturer to put in place the new Thunderbolt port. This novel technology was designed collaboratively with Intel under the codename "Light Peak". 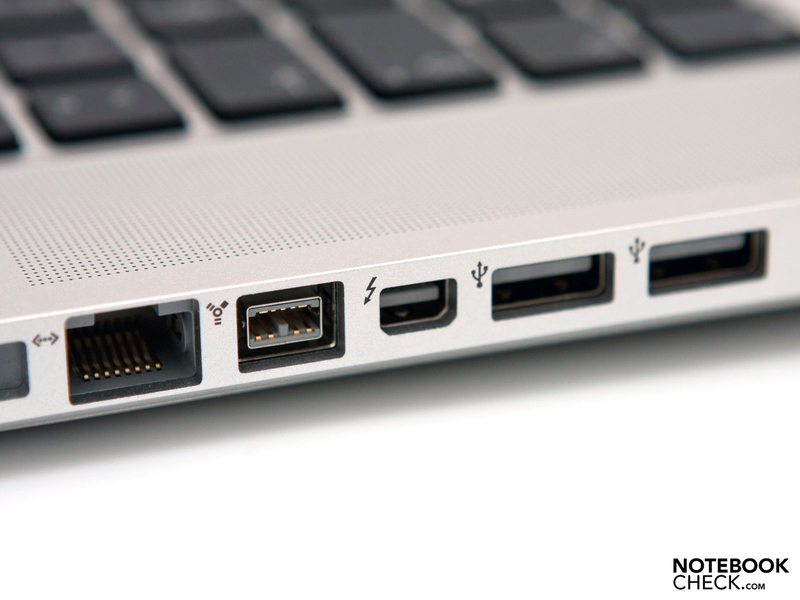 The Thunderbolt port is meant for high-speed data transfer, which can reach a maximum of 10 GBit/s. Currently, this port—which is combined with a Mini DisplayPort—can be used to either hook up an HD monitor or up to five daisy-chained storage devices at once. With this kind of power, the port has earned its name and respective lightning bolt logo. So far, Apple has not made any claims about attaching multiple monitors via this port, restricting itself to just one. 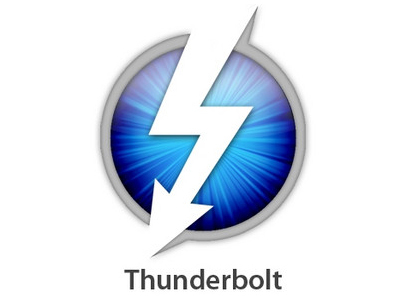 Moreover, no peripheral devices compatible with the Thunderbolt port are due to be released on the market until two weeks after the Macbook's own release date. Jason Ziller from Intel shows the power of this connection in this short YouTube video, in which the transfer rate peaked at about 800 MB/s. On the other side of the notebook, we find the usual 8x SuperDrive (DVD burner) and a Kensington Lock Slot. The lack of a USB 3.0 port and HDMI output is understandable, but why is the Cupertino-based laptop giant still not including a Blu-Ray drive? The company seems to be pushing for video downloads from their own Apple Store. This leads us to speculate that the next generation might have no disc drive whatsoever and the case design, in turn, might be changed. The placement of ports is well thought-out, but they could have been spaced out from one another a bit more. Large USB drives or 3rd Party Mini-DisplayPort connectors, for example, can get in the way of other ports. The relatively small variety of ports is helped out a bit by the new Thunderbolt port, but a third USB port really would have been nice, considering most current peripheral devices use it. The landline internet port, that is, the RJ-45 Ethernet once again uses the Broadcom (NetXtreme) Gigabit Controller. The combination wifi/bluetooth module, however, has been revamped. Wifi continues to use the 802.11b/g/n standard (Broadcom BCM4331), but is connected to three WLAN antennae, which should provide for a better signal. Included is the most recent Bluetooth 3.0 +HS (Broadcom BCM2070), but Apple is officially advertising it only as version 2.1 +EDR. A built-in UMTS card is not available in the newest Macbook Pro. The list of accessories is minimal as usual and aside from the notebook, you'll find the power supply and cord, the user manual "Everything Mac", additional instructions "Everything Else", two software DVDs, stickers, a cleaning cloth and nothing more. The current operating system, Mac OS X 10.6.6 Snow Leopard, comes pre-installed. Updating to Mac OS X 10.7 Lion, coming in Summer 2011, should be quick and easy as always (but comes at an additional cost). The customization options, accessories and additional software offered through the Apple Store covers just about everything, but shopping around elsewhere might very well yield some considerably lower prices. 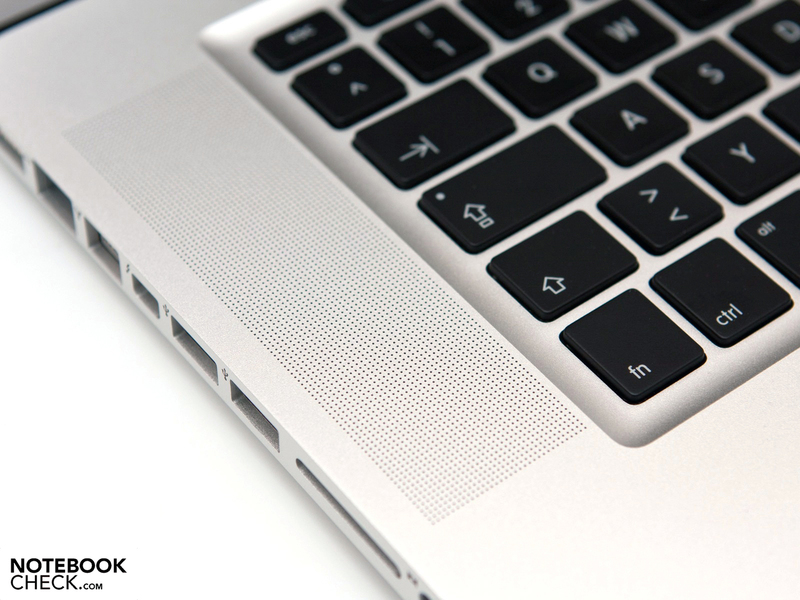 The MacBook Pro comes with a standard warranty of only 12 months including 90-day over-the-phone technical support. Other manufacturers of laptops in this price range include a standard warranty lasting 24-36 months at no additional cost. You can opt into the Apple Care Protection Plan (ACPP) to extend the warranty and over-the-phone tech support to 36 months. At a recommended retail price (RRP) of 349 Euro, though, the extended warranty doesn't come cheap, amounting to an entire 20% of the laptop's starting price. The MacBook Pro 15 comes with your choice of three different 15.6" screens. Next to the standard glossy, reflective screen with a native resolution of 1440 x 900 pixels (review coming soon), two high-resolution options are also available. 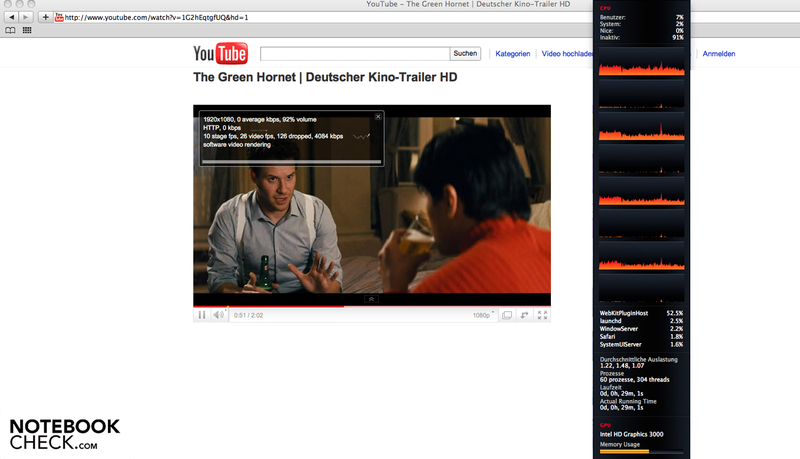 Both have a resolution of 1680 x 1050 pixels in the ever-more-popular 16:10 aspect ratio. Coming with an extra glass pane covering the screen and black display frame, these hi-res models cost an extra 100 Euro. The model we reviewed with a non-reflective hi-res display goes for 150 Euro extra, a bit expensive but has a nice silver display frame in return. Another plus of choosing the matte screen, is that it brings down the weight of the laptop (matte: 2.446 Kg - glare-type: 2.515 Kg). On the other hand, the glare-type screen makes colors appear crisper and is easier to clean. 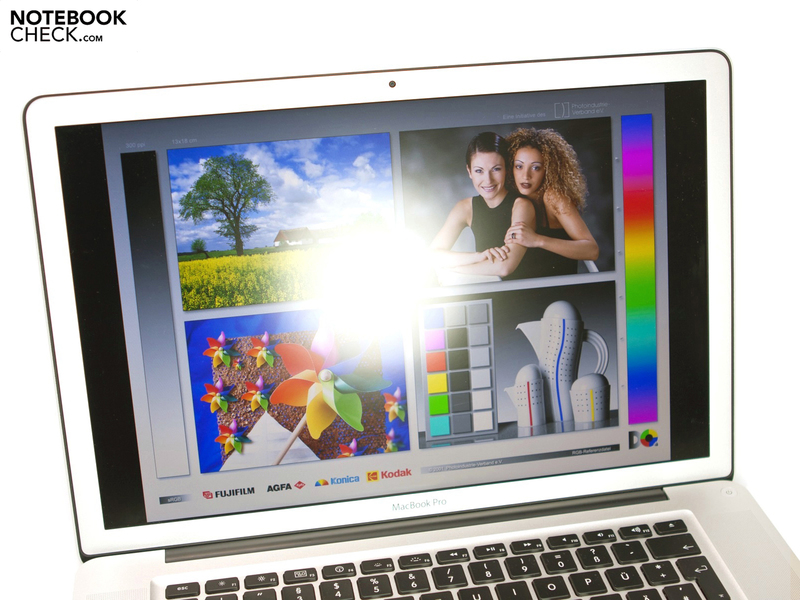 The Samsung display, model number LTN154MT07, has an LED-backlight and is the same one as used in the current MacBook Pro's predecessor from 2010. This has been confirmed by some users of the glossy-screen model. 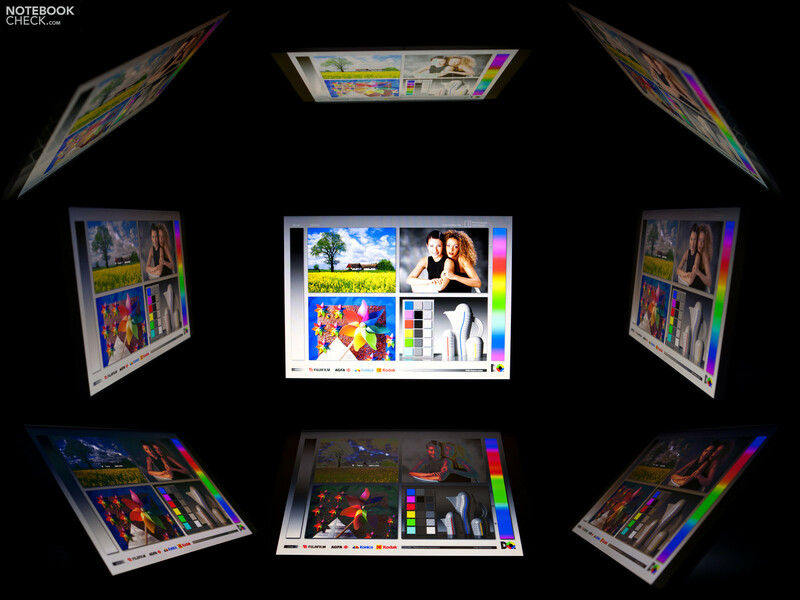 The maximum screen brightness of 302 cd/m² and average of 288 cd/m² make this display rank in among the best of them. In terms of sharpness, color crispness and contrast, the picture appears excellent, by no means worse than the glossy version. Other measurements likewise leave a good impression. The low black level of 0.52 cd/m² provides for saturated-looking blacks as well as a contrast ratio of 581:1. Combined with the matte screen, this Samsung display is well equipped for outdoor use. Above the screen we find something new: the FaceTime HD webcam. Unlike its predecessor, this camera shoots 1.3 megapixel pictures and video, allowing for video chatting in a resolution of 720p. Video-chatting via Skype (FaceTime webcam to iPhone 4), we observed fairly good picture quality. A photo taken using PhotoBooth was not displayed in 1280 x 720, however. This application might just not have been updated yet. The quality of recorded video leaves a decent impression, although webcams like the Logitech HD Pro C910 Webcam are leagues above the FaceTime. The color space is particularly meaningful in photo- and video-editing. 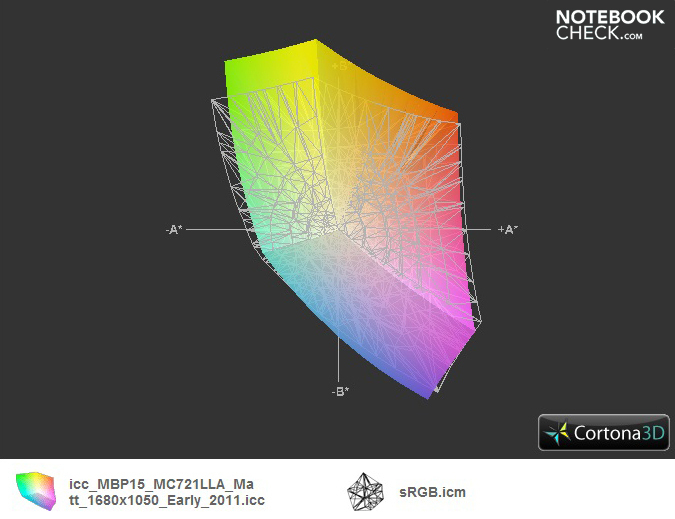 The sRGB color space is one of the standard references as basis for comparison. The sRGB spectrum is—like its predecessor—for the most part covered by the new MacBook Pro. The difference compared to the MacBook Pro 13 and MacBook Pro 17 (glare-type) from last year is rather small. The uncontested champion in this regard remains the Dell XPS 16 Notebook with an RGB-LED display (covers Adobe RGB color space). The matte finish and high screen brightness make for easy use outdoors. Under strong direct light, parts of the screen can become difficult to discern, but the picture as a whole remains very visible. At no time do irritating reflections appear on the screen, however. 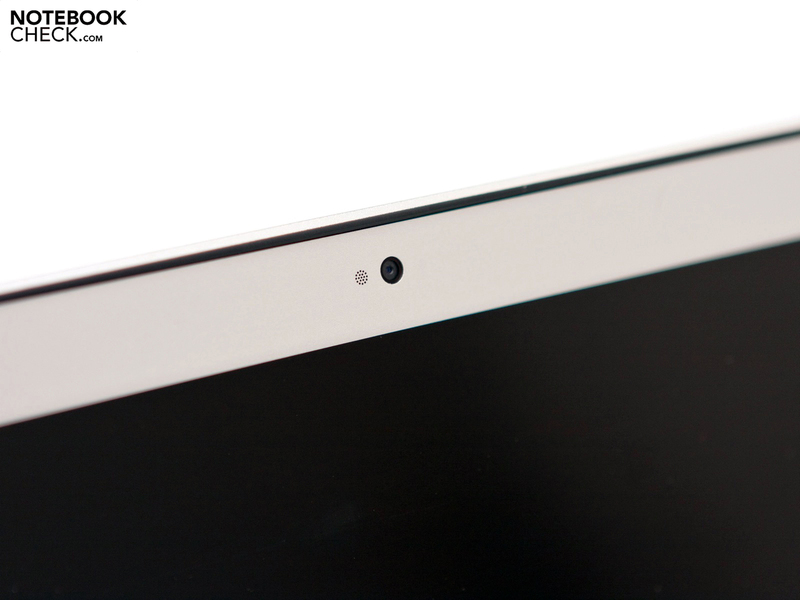 The matte display frame is also a plus in this regard with no reflections popping up around the edges of the screen. 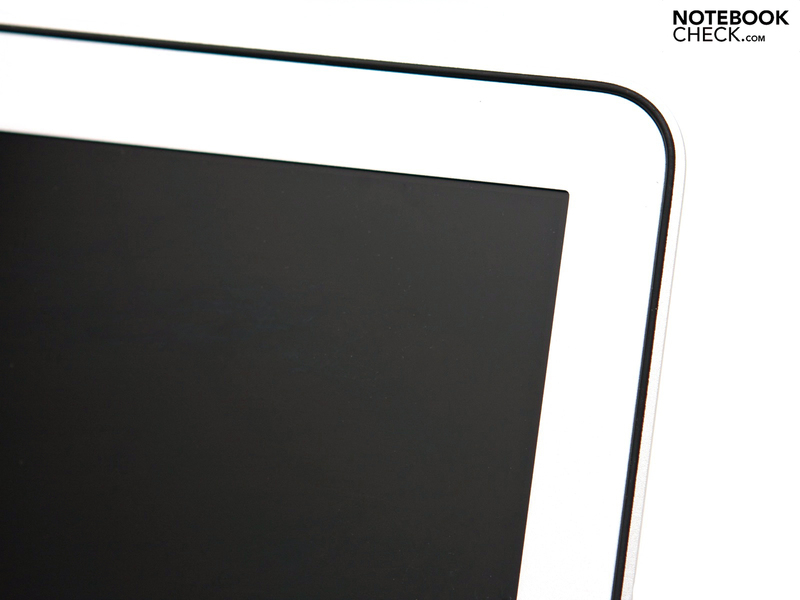 Altogether, the matte version has a clear advantage over the glossy, reflective screen for outdoor use. The range of viewing angles on the MacBook Pro only slightly sets it apart from the overwhelming majority of notebooks. Looking at the screen from the left or the right (horizontal), colors remain clear and screen brightness high even at sharper angles. When tilting the screen back and forth (vertical) away from the ideal viewing angle, the pictures begins to look like a negative of itself. This, however, only happens at sharper angles and should not come up during normal use. 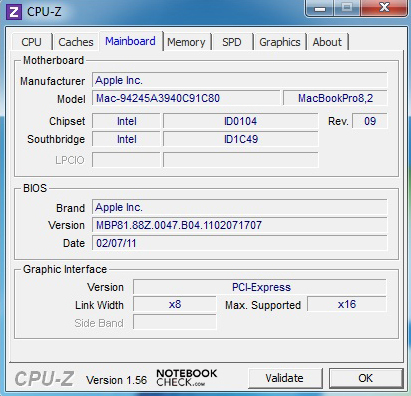 A total of three models of Intel processors of the current Huron River platform are available for the Apple MacBook Pro 15. The premium model may be fitted with an Intel Core i7-2720QM (2.2 GHz, 6 MB L3-cache) or an Intel Core i7-2820QM (2.3 GHz, 8 MB L3-cache) as well as a dedicated AMD Radeon HD 6750M graphics card. 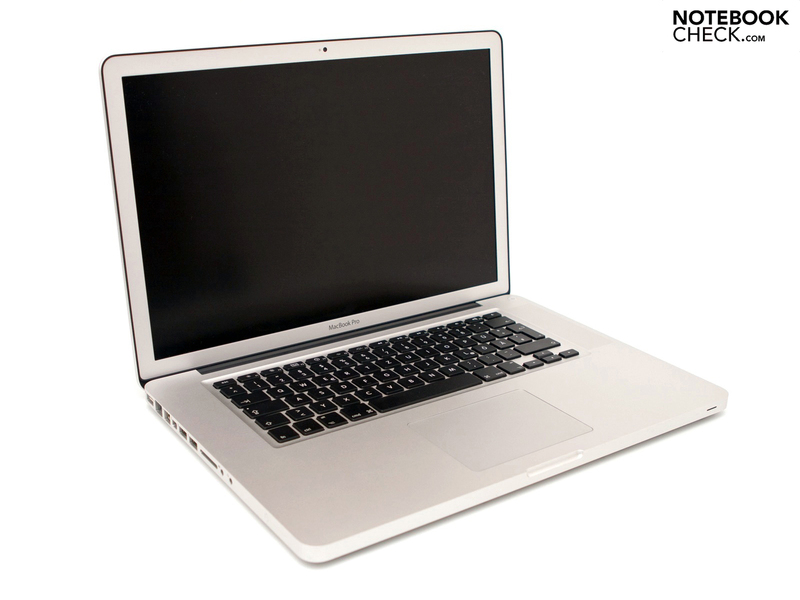 The starter model we reviewed came with an Intel Core i7-2635QM quad-core CPU, running at a base clock rate of 2.0 GHz. Using the processor's Turbo Boost 2.0 technology, it's theoretically possible to bring the clock rate up to 2.9 GHz or as low as 800 MHz (Speedstep). Just like with the graphics card, the system automatically chooses the appropriate clock rate depending on the level of performance needed. The self-standing, dedicated graphics card in the entry-level model is the AMD Radeon HD 6490M with 256 MB GDDR5 RAM, and the on-board graphics card here is the Intel GMA HD 3000—which is built right on to the processor. This integrated graphics card is only active during low-stress tasks so that the laptop doesn't consume too much power. During preliminary testing, using the Intel Turbo Boost Widget and the MSR Tool we observed that the system made use of both the Turbo Boost and Speedstep functions (Windows). A member of the second generation of Intel Core-i processor, the Core i7-2635QM cuad-core CPU ranks in above average as far as mobile processors go. With clock rate of 2.0 GHz and four cores, it can use its Hyper-Threading technology to simulate an additional four virtual cores, therefore processing a maximum of 8 threads simultaneously. Compared to the more powerful 2720QM in more expensive models, our 2635QM does not offer AES Instructions, which speeds up encryption of data. But the current version Mac OS X doesn't support these anyway. To see how our processor measures up to other CPUs, we used the program BootCamp to install Microsoft Windows 7 and ran various tests. Aside from its graphics card testing benchmarks, Futuremark also has some benchmarks to test CPU performance. In the 3DMark 2006 CPU benchmark, the i7-2635QM earns the MacBook Pro a good 4906 points, placing it in the upper third of all previously tested laptops. 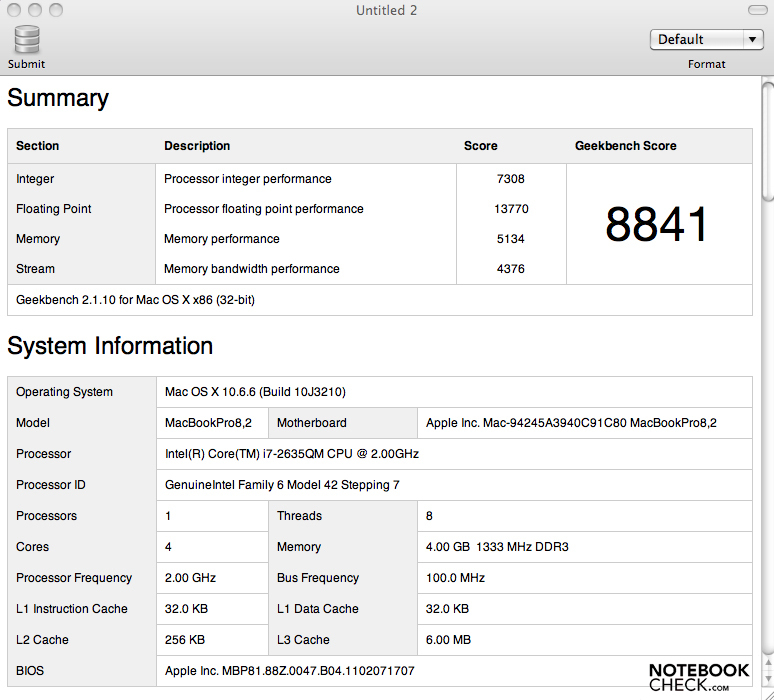 The Intel Core i7-620M dual-core processor from the previous MacBook Pro managed a significantly lower 3148 points, ranking in very average (improvement: +35.8%). In the current 3DMark Vantage CPU test (Performance Preset), the new MacBook Pro 15 once again racks up a good 16,710 points. the new MacBook Pro 17 Early 2011 with a more powerful Intel Core i7-2720QM places a mere 1000 points ahead of our MacBook Pro 15. The somewhat older CineBench R10 single-core rendering benchmark (1 thread, 64-bit) once more indicates the new Huron River platform's high level of performance. The Intel Core i7-2635QM earns a good 4583 points, making it into our top 25 of all the notebooks we've ever tested, although notebooks with the older Intel Core i7-640M CPU are not at all far behind. Among these is the Sony VAIO VPC-Z13Z9E/X, whose eventual successor might prove to be a formidable rival to the new MacBook Pro. In multi-core rendering as well (64-Bit) with 8 threads, the new Apple laptop makes a name for itself with 15,522 points. In the newest version of CineBench, CineBench R11.5, the i7-2635QM manages a high 4.6 points in the CPU test. As expected, this puts the quad-core processor in fourth place out of all the Sandy Bridge processors. 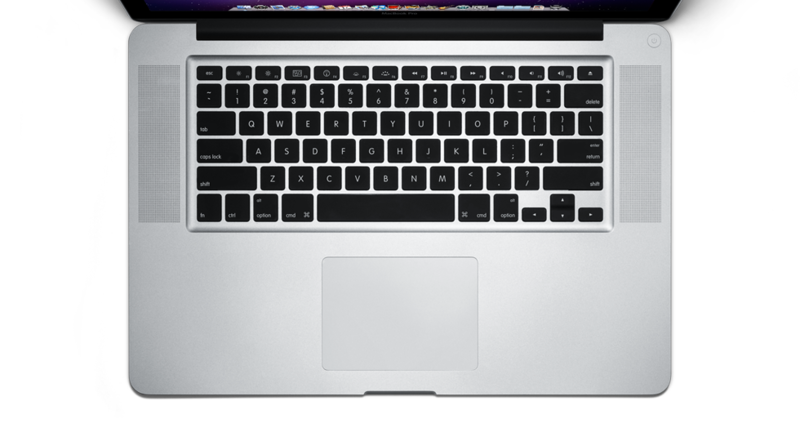 At the top of the list—with the exception of Desktop processors—we find the i7-2920XM, the i7-2720QM and the i7-2820QM, which the MacBook Pro 15 Early 2011 can be equipped with on request. 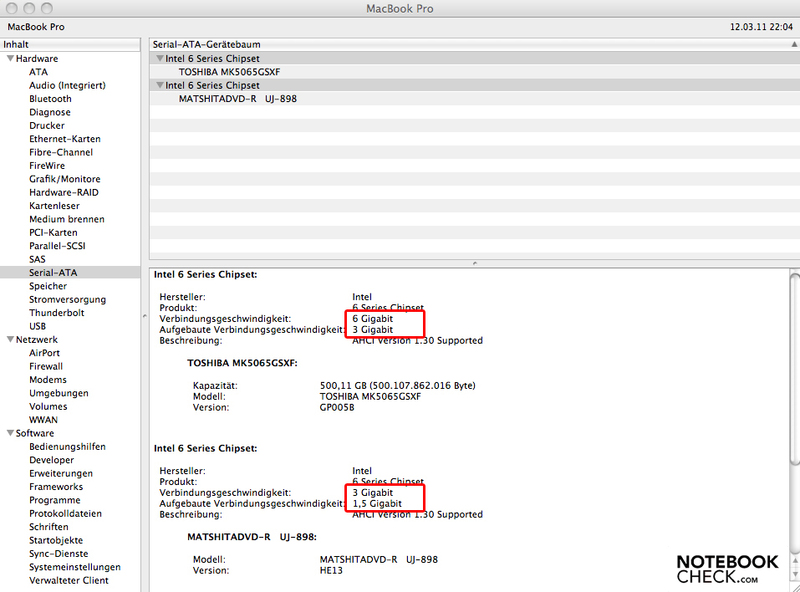 Apple, however, does not provide for swapping out the already-installed CPU after purchase. The WPrime 1024 and SuperPI 32M computational tests confirm the results of the previous benchmarks. 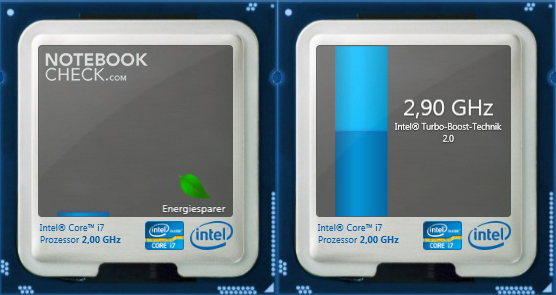 The CPU's quick computations once again place it among the best, only to be beaten by more powerful Sandy Bridge CPUs and desktop processors. All in all, we can confidently say the new Intel Core i7-2635QM has made a substantial leap in performance compared to the older Intel Core i7-620M from 2010. Thanks to Turbo Boost 2.0, the quad-core CPU can still rack up a lot of points while utilizing fewer of its cores. 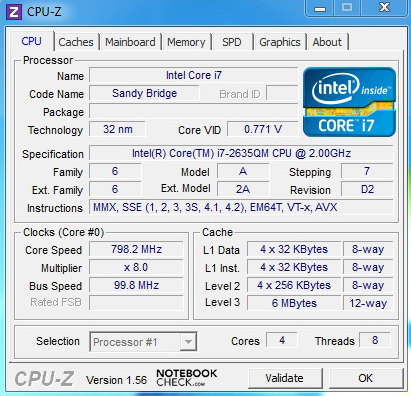 The i7-2635QM has secured its high status among the three other, more powerful Sandy Bridge CPUs. Comparisons to older models (e.g. 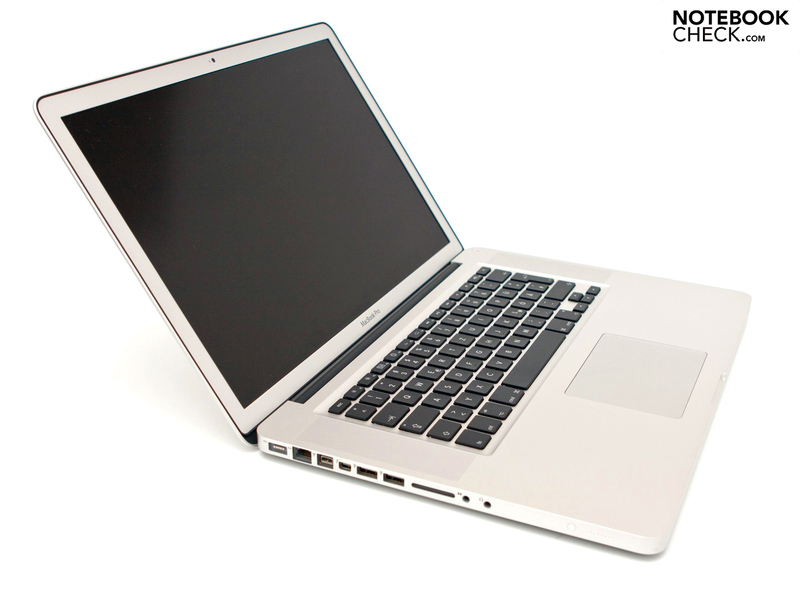 : MacBook Pro 13 Mid 2009) with an Intel Core 2 Duo CPU show an even clearer difference. In single- as well as multi-core tests in Windows, this Sandy Bridge processor makes a great impression. Under Mac OS X 10.6.6 as well, we performed the most current benchmarks on the CPU. 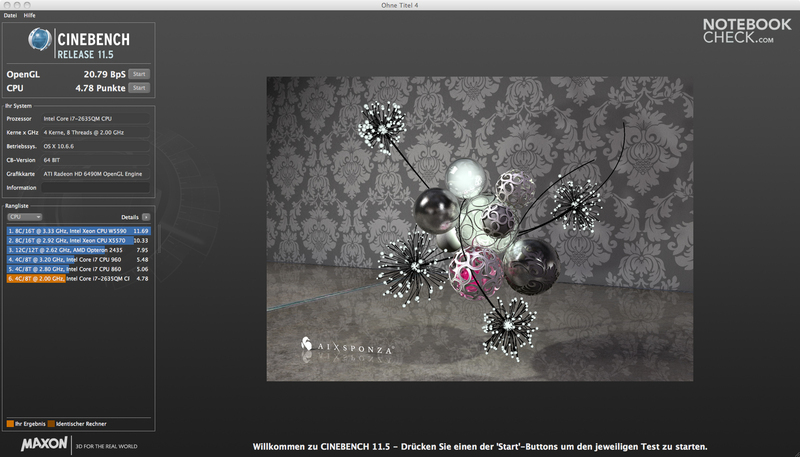 In CineBench R10, the results are a bit lower than in the 64-bit Version of Windows 7. 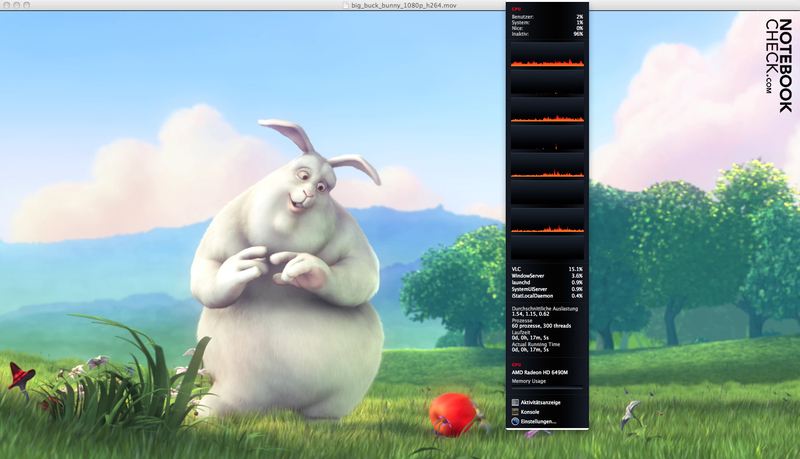 Still, the single-core benchmark does show that the Turbo Boost function works under Mac OS X. In the newer CineBench R11.5, the CPU earns 4.78 points in multi-core rendering, about 4% more than in Windows. Single-core rendering is, however, about 5% worse. The OpenGL benchmark shows similar results. GeekBench shows that Mac OS X seems to be using the hardware better and achieves a result 14% better than in Windows. 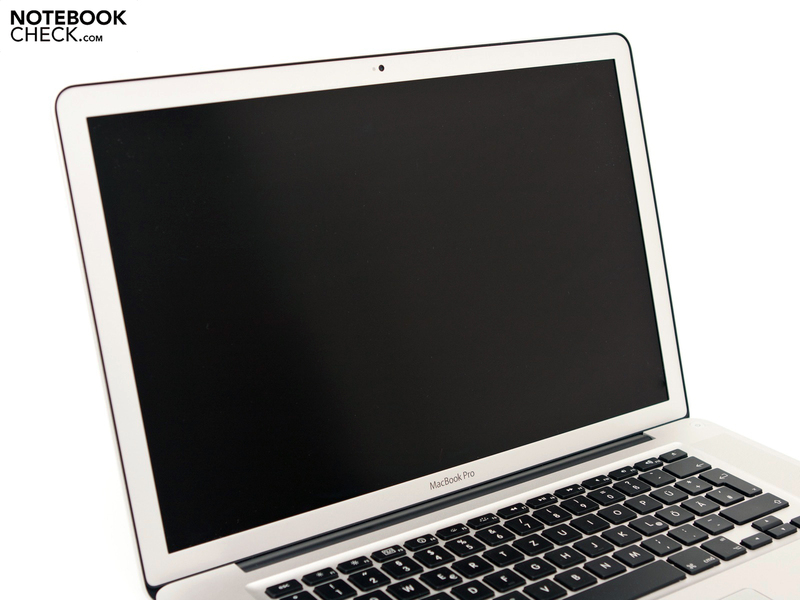 Using PCMark Vantage (Windows 7) we rated the overall performance of the Macbook Pro 15 Early 2011. 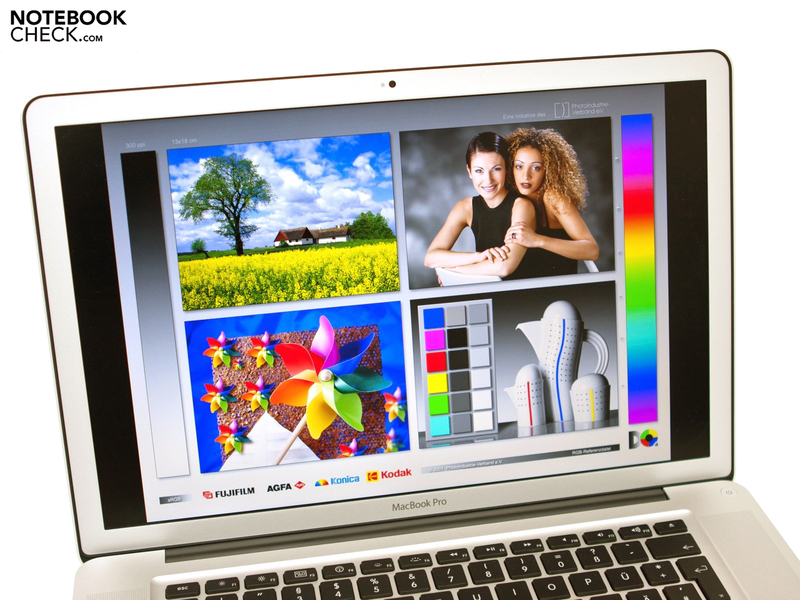 With a score of 6846 points, the laptop ranks in among the top third of all laptops tested with this benchmark. This puts it just about on par with the Lenovo ThinkPad T410, the HP Envy 14 Beats Edition and the MSI GT660R with Intel Core i7-620M CPU. 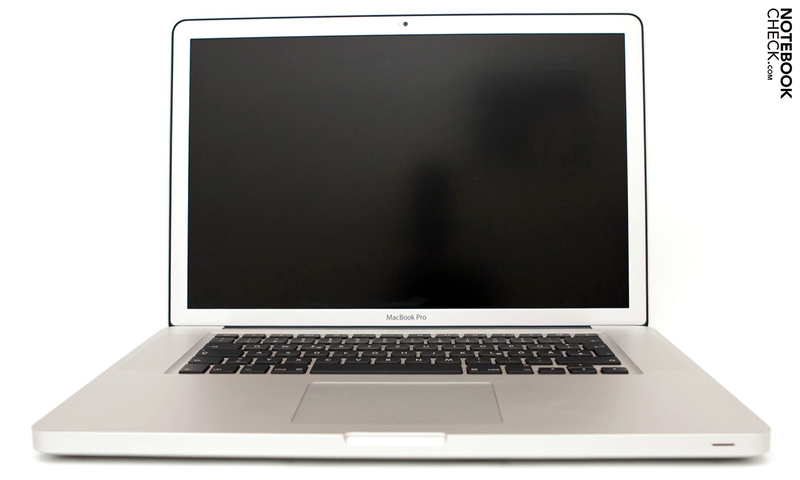 the earlier MacBook Pro 15 Mid 2010 (the premium model) with i7-620M earned 6109 points, about 11% lower than the entry-level 2011 MacBook Pro in this review. We tested the application performance of the 15" MacBook Pro Early 2001 in Mac OS X using XBench 1.3. The benefit of the new Sandy Bridge processors can most notably be seen in the processing- and memory-intensive tests. The Core i5-540M of the 17" MacBook Pro from 2010 doesn't stand a chance here. But its GPU, (faster in Windows) the GT 330M matches the performance of the HD 6490M with GDDR5 (Quartz, OpenGL and User Interface Test). In the hard drive benchmark, all notebooks with HDDs are at a great disadvantage to the MacBook Air, which comes equipped with an SSD. The transfer rates of SSDs are not a great deal better than HDDs, but their random access times are leagues above those of conventional HDDs. 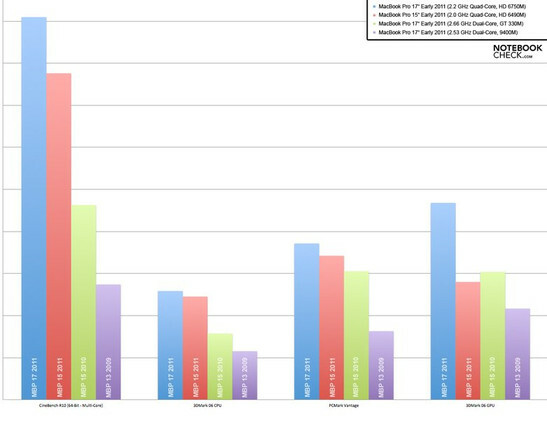 The image below shows the results from multiple trials with the 17" MBP (6 trials, black) and the 15" MBP (5 trials, red) compared to older MacBooks. Apple offers various hard drives for the MacBook Pro 15, 5400 RPM as well as 7200 RPM HDDs, not to mention your choice of two Solid State Drives if you'd like to go that route. The MacBook Pro 15 we reviewed came with a 2.5" hard drive from Toshiba (model number: MK5065GSXF) with 500 GB of storage space, spinning around at 5400 RPM. Its maximum transfer rate, measured with HD Tune Pro 4.6, comes to 75.3 MB/s, typical for HDDs with these specs. 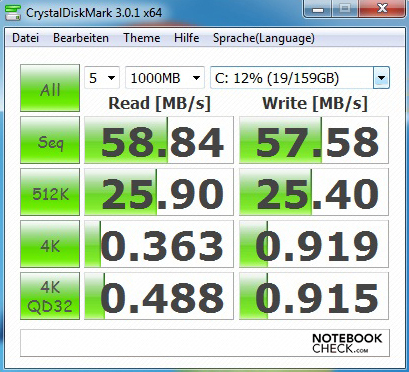 The CrystalDiskMark benchmark shows slightly lower results, but these are still within the scope of expected transfer rates for this HDD. An advantage of Intel's Huron River plattform is the capability to hook up an external hard drive via S-ATA III with up to 6 GBit/s. Most currently available hard drives can't make full use of this feature, only Solid State Drives (SSDs) offer this level of performance. Two good examples are the Intel SSD Serie 510 alias Elmcrest and the OCZ Vertex 3. During a sequential read operation on a single hard drive, transfer rates of about 500 to 550 MB/s are possible. A look in the Mac OS X System Profiler does not reveal good news for the caffeinated. The hard drive is connected with a fast 6 GBit/s lane and will be able to keep up with your jittery fingers, but the SuperDrive (DVD drive) might frustrate you because it can only transmit and receive data at 3 GBit/s at most. 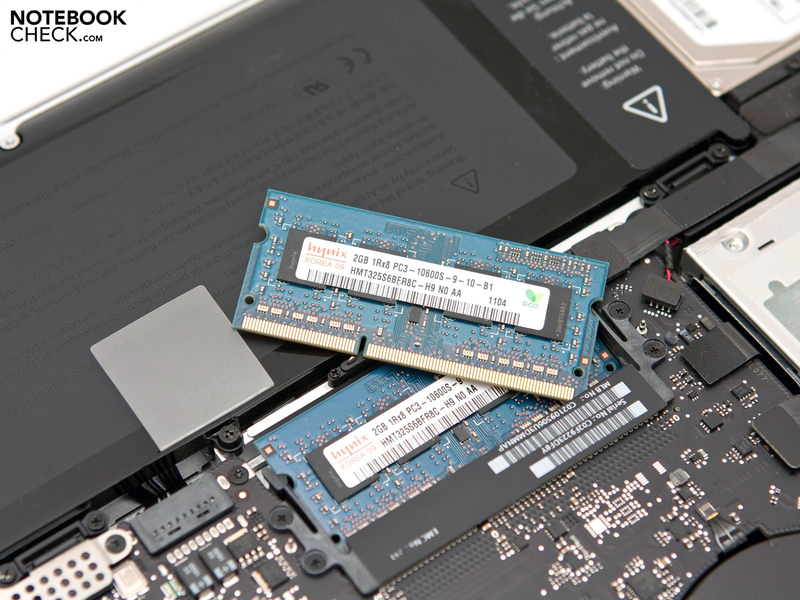 A High-speed RAID with two Solid State Drives (SSD) of the new architecture—like the MacBook Pro 13 Mid 2009 easily made use of with the help of an adapter—is just about out of the question. The adapter from MCE Technologies is indeed compatible but the second SSD would be limited to 300 MB/s (3 GBit/s). The new Thunderbolt port does provide a (partial) solution to this little conundrum (max. 10 GBit/s). The entry-level model with AMD Radeon HD 6490M and a core clock rate of 750 MHz with only 256 MByte GDDR5-RAM is not quite meant for the most recent, resource-demanding games. The focus is rather on multimedia. Apple also offers a version of the 15" MacBook Pro with the more powerful AMD Radeon HD 6750M and 1GB GDDR5. The graphics card (HD 6490M) in the laptop at hand—based on the SeymoreXT Chip—ranks in as a mid-grade starter GPU similar to the Nvidia GeForce GT 330M of the preceding MBP. 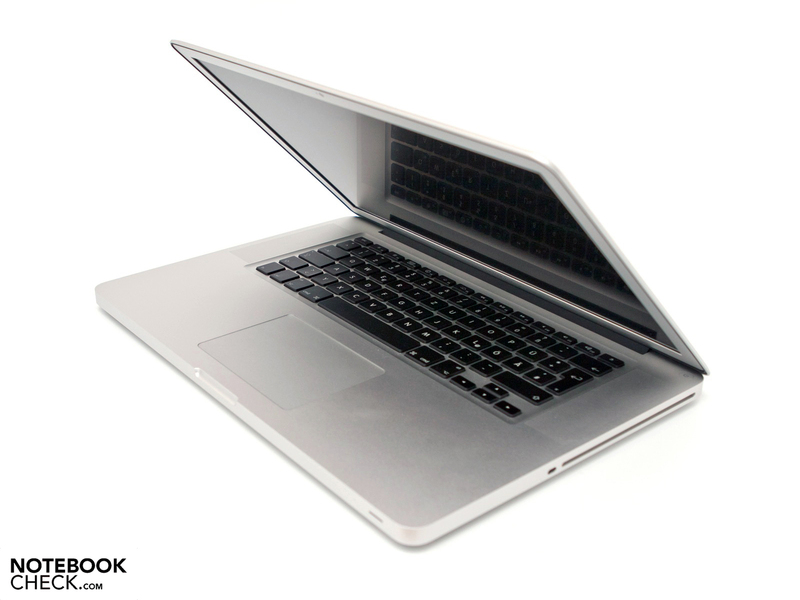 In 3DMark Vantage, the laptop earns 2541 points, amounting to a difference of 6.4% over the 2010 model. The AMD Radeon HD 5650 with 1 GB GDDR3-RAM is a class above the GPU here, with the HD 5650 outstripping the graphics card card in place in our test notebook by approximately 13%. 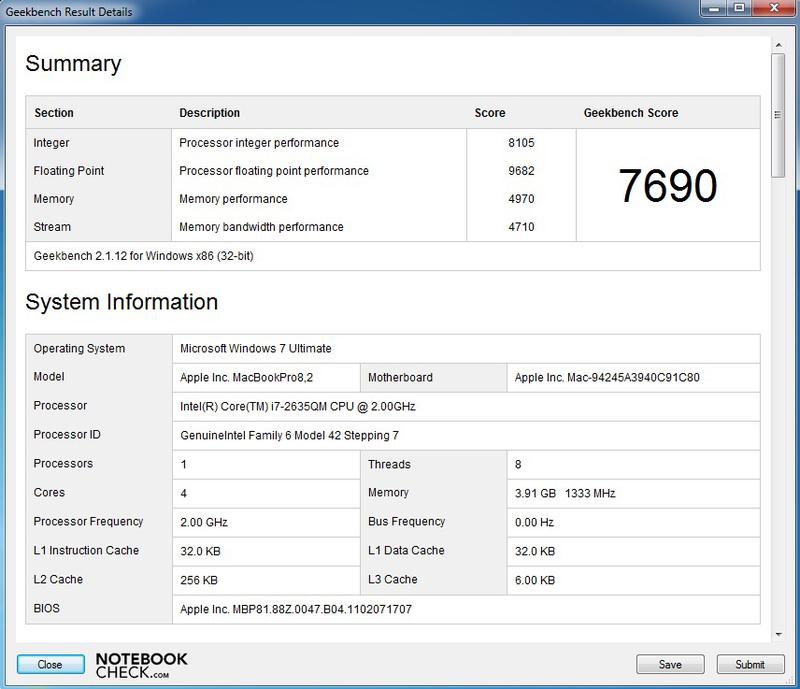 The Apple MacBook Pro 17 Early 2011 with a more powerful AMD Radeon HD 6750M earns 5536 points in the same benchmark. Combined with the stronger CPU, The 17-inch model's performance surpasses the 15-inch MacBook Pro's by 54.2%! 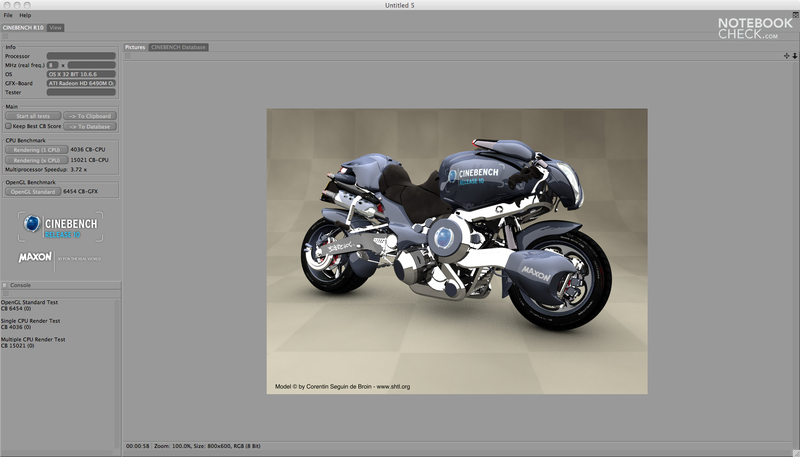 We tested the laptop's OpenGL performance via CineBench (Windows 7). In the 64-bit version of CineBench R10, the 6490M earns a good 7016 points, ranking in among the best. 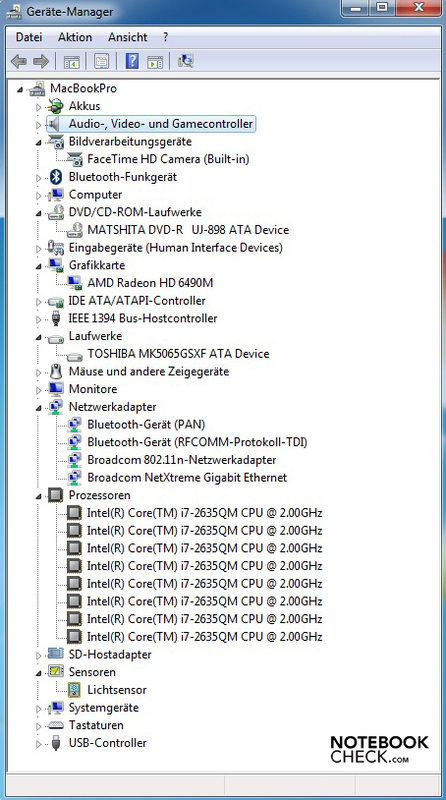 A more powerful model would be the Acer Aspire 7750G with AMD Radeon HD 6850M (7875 points, +10.9%). 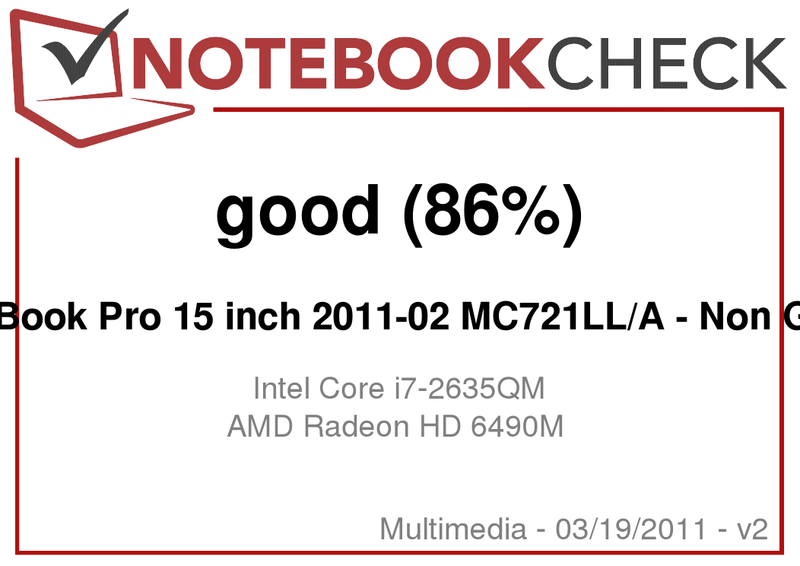 The MacBook Pro Mid 2010 with Nvidia GeForce GT 330M trails far behind, ranking in about average. The improved performance of the new AMD graphics card amounts to 45.6% in this benchmark (3814 points). The current CineBench R11.5 shows similar results. With a score of 22.1 points, the GPU is on par with the AMD Radeon HD 5650 (Acer Aspire 3820TG), which managed a better score in 3DMark. The Nvidia GeForce GT 540M, for example, is a notch above these two in this benchmark. 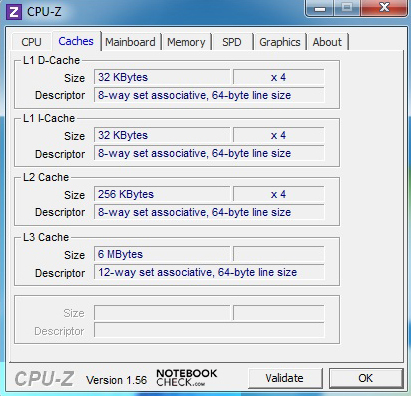 The GT 540M can be found in the new multimedia notebook, Asus N53SV. In both CineBench tests, the GPU makes a good impression, which shows that the Windows Bootcamp driver is well optimized for OpenGL. The games we tested confirm the results of the above mentioned synthetic benchmarks. The current MacBook Pro 15 Early 2011 with a modest graphics card is fit to run games with low to moderate graphics settings in Windows. With minimal graphics settings, even the demanding Battlefield: Bad Company 2 runs at a smooth 48 fps. The ever-popular Starcraft II – Wings of Liberty runs at more than 190 fps. Games aren't incredibly fun when playing in low resolutions with low detail settings, though. With moderate detail settings and the next best resolution, the refresh rates dwindle. Battlefield: BC2 still runs fairly smoothly at 26.6 fps, but the hardware appears as if pushed to the limit. Games with simple 3D graphics like TrackMania Nations Forever expectedly run smoothly even with high detail settings. The folks over at AnandTech have taken a closer look at Gaming Performance under Mac OS X. Starcraft II runs very smoothly with moderate detail settings and a resolution of 1280 x 800 pixels at 53 fps, while the result in Windows 7 (33.7 fps) was a great deal worse. The same benchmark sequence in the single-player campaign was used to test performance in both cases. There seems to be some potential for gaming on this laptop. But can the more powerful version (MC723LL/A) with AMD Radeon HD 6750M and 1 GB GDDR5-RAM stand up to the demands of recent releases in their full graphical intensity? The 3D benchmarks from Futuremark show an improvement of around 50% with the more powerful hardware housed within the MacBook Pro 17 Early 2011, making it at least in part fit for a top-notch gaming experience. The new hardware has no trouble at all playing full-HD videos, while the sources of these videos and their format apply different levels of stress to the system, however. 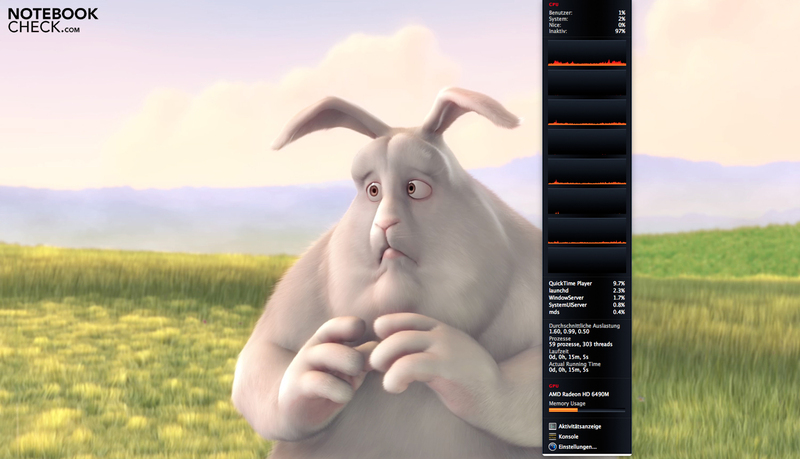 Playing the film "Big Buck Bunny" (H.264, 1080p) off the hard drive using QuickTime and VLC players, we experienced a system load of 3% to 6%, VLC using up comparatively more resources. Whether it's Intel Quicksync or AMD UVD3 that's being used here is not entirely clear. Compared to an old MacBook Pro 13 with GeForce 320M, the task manager shows the CPU load to be higher here (overall system stress is of course lower). Flash HD videos are likewise no trouble to play. Running a recent film trailer in 1080p, processor/on-board GPU combination is used to the extent of 7 - 12% (26 fps, 4084 kbps). 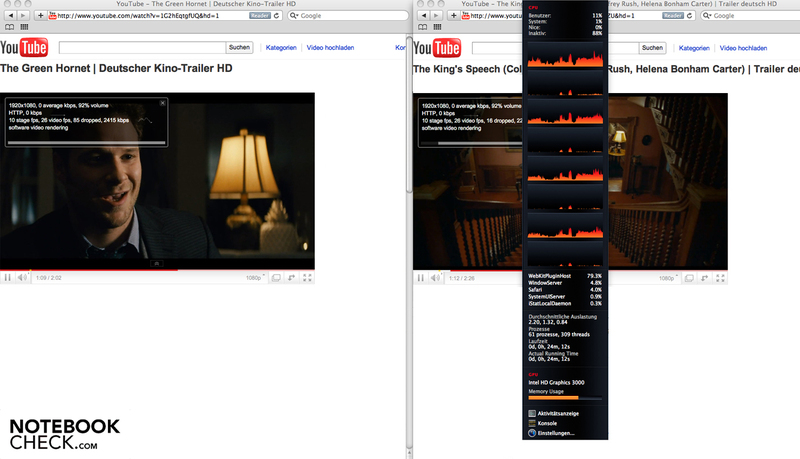 Running a video of the same quality through YouTube raises the load to 11 - 15% (26 fps, 2415 kbps). According to Anandtech, currently only FaceTime HD uses some QuickSync components for encoding HD videos. Nevertheless, a CPU core is under some heavy stress when transmitting these videos. Apple has not provided us with any more details on this issue so far. Our stress test in Windows, which brings CPU and GPU load to 100%, seems to get the hardware huffin' and puffin' just like with the older MBP. The temperature of the processor cores quickly climbs to over 95ºC in the course the Prime95 test and once past the 100°C mark, the HWInfo32 tool shows that some throttling, i.e. slowing down, is going on in the CPU cores. After long periods of heavy use (especially the Furmark benchmark) the system switches down to a multiplier of 8x-12x (800-1200MHz). This could also possibly be caused by the small power supply (85-watt power supply compared to the 90.4 watt highest observed power consumption of the laptop). While both the Furmark and Prime95 benchmarks were being carried out, we observed that the power consumption was at 90.4 watts and the CPU functioning at a clock rate of between a low 800 and 1200 MHz. As soon as Prime95 is turned off, the CPU speed jumps back up to the base clock rate of 2.0 GHz, the Turbo Boost automatically turns on and the energy consumption goes down to a sustainable 85.8 watts. 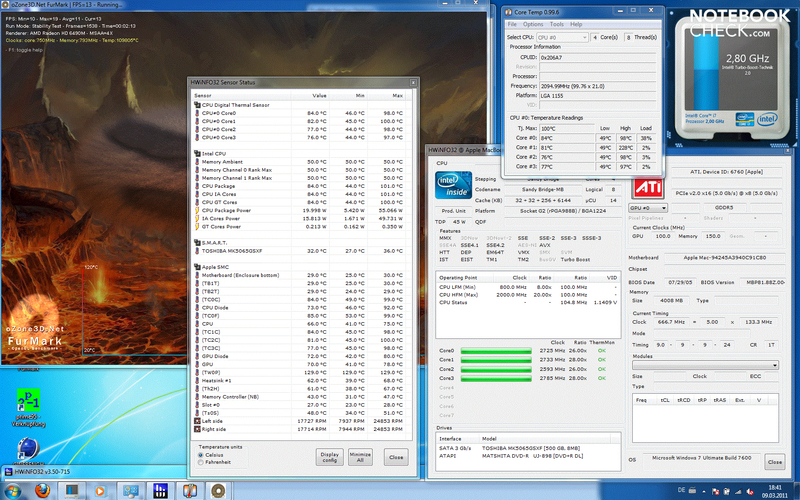 HWInfo 32 and the Intel widget both show a multiplier of 28x for short stretches of time (= 2.8 GHz). The maximum clock rate possible 2.9 GHz (29x) was only observed for very short bits of time. The resource-demanding Battlefield Bad Company 2 likewise pushes the system to the limit of energy consumption and heavily stresses the hardware. The Turbo Boost works smoothly at first. But then the clock multiplier drops to 8x-16x (800-1600 MHz)—usually stays at a constant rate. The refresh rate, meanwhile, remains more or less unaffected. The processor temperature remains within bounds, not forcing the thermal throttling seen in the stress test with Furmark and Prime 95. It's interesting that this drop in clock rate can't always be reproduced under the same conditions. As with the 17" model, the problem might be due to the power supply being too small. When playing Call of Duty: Black Ops, we did not observe this throttling. The processor remained at a nearly constant 2.6 GHz throughout (Turbo Boost). Moreover, a second trial of the 3DMark06 benchmark after 9 hours of very heavy use yielded the same results as the first trial at a much cooler temperature. Aside from the DVD drive and the hard drive, two fans play their part in producing the laptop's ever-present background noise. These fans remain unchanged from the previous MBP and gently hum in the background under light use. In idle mode under Mac OS X, the fans and HDD make for a maximum 31,2 dB(A) of noise. Under heavier use, the fans spin faster and therefore louder. The highest value we recorded under Mac OS X during high CPU stress only came to 37 dB(A), not very noticeably loud. Still, the hardware could not be subjected to as high a level of stress than in Windows (due to the lack of comparable software). 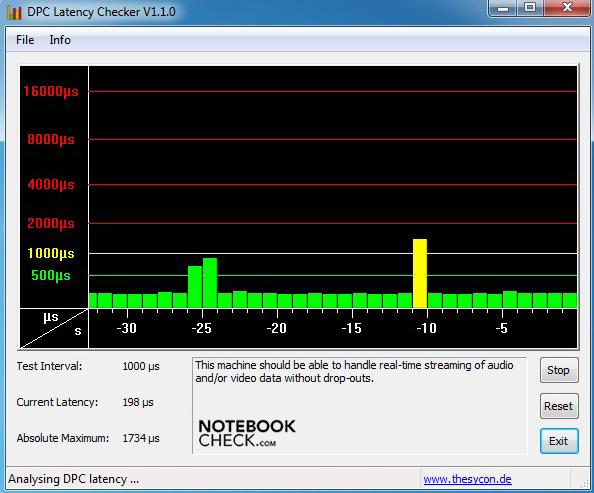 Under Microsoft Windows 7, we once again observe the poor configuration with the hardware (maximum: 46.1 dB(A)). This increase of about 10 dB(A) sounds twice as loud to the human ear. Here, the fans are a good deal louder than the previous model and only die down after a long while. 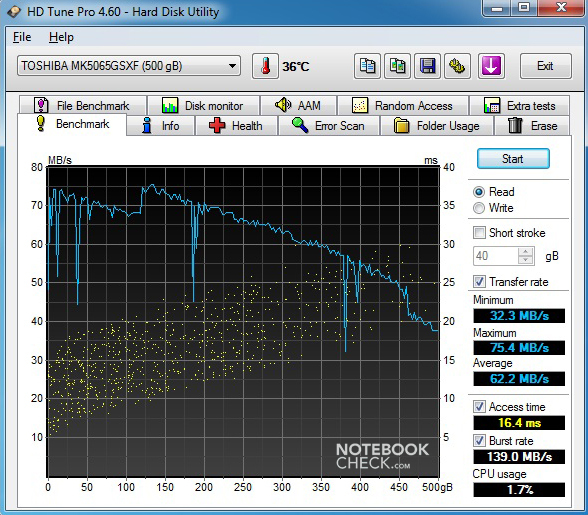 Thanks to its isolated position and a maximum of 5400 RPM, the 2.5" hard drive remains relatively inaudible. From 15 cm away, we measured a low 31.4 dB(A) during use, in the form of a gentle hum. With the Solid State Drive (SSD) version, there's no such noise at all. The case temperature stays within normal bounds but sometimes rises significantly because of the slow-spinning fans. In Mac OS X, the fans pick up the pace only after a good while of heavy use. As a result, we measured a maximum of 44ºC along the base plate (when streaming a video). Just before the fans start spinning faster, the laptop can become very warm to the point of being uncomfortable to hold on your lap. 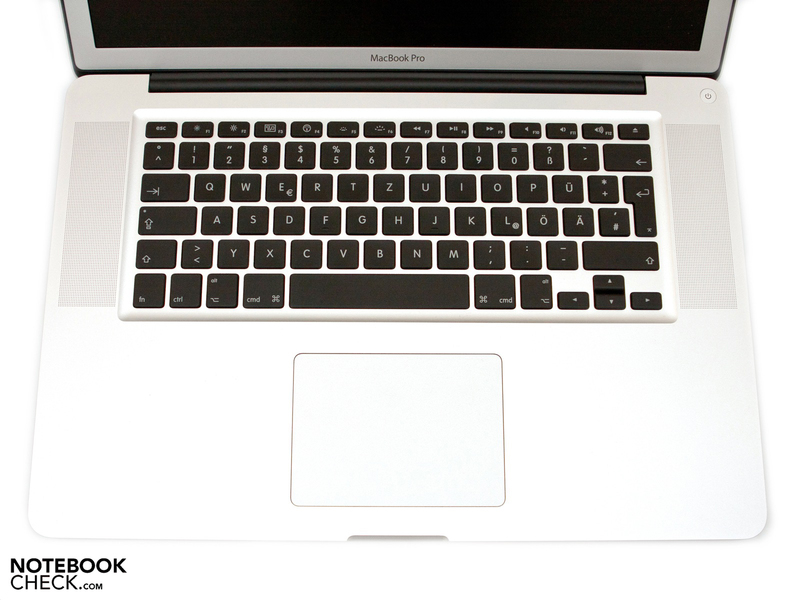 The border area around the keyboard also gets particularly warm, reaching 39.1ºC near the top of it. 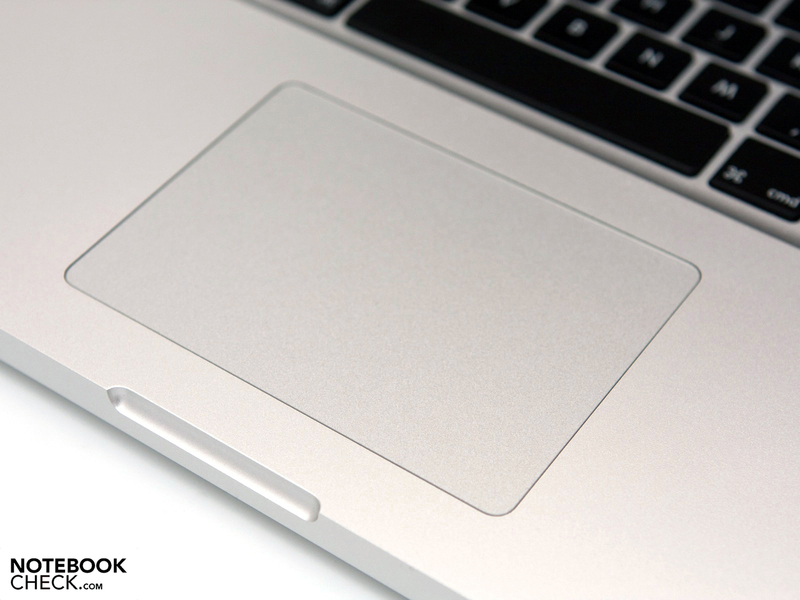 Areas that are frequently in contact with skin like the keyboard, the trackpad and the palm rest remain cool to the touch. Under Windows 7 we once again measured temperatures as high as 46.2°C on the base plate, and 44.0ºC above the keyboard—both these measurements were taken after several hours of heavy use. When the laptop is idle, the temperature reaches a still-very-cool 24ºC in Mac OS X and 26.4ºC in Windows 7. Compared to the MacBook Pro 15 Mid 2010 (with a more powerful CPU, actually), our test laptop reached only slightly higher case temperatures. For the temperature rating, we considered the temperatures under Mac OS X as well as Windows 7. All things considered, Apple trades off low noise levels for a sometimes uncomfortably warm case surface. When the laptop is sitting on top of a table, the heat's not noticeable anyway because the keyboard and palm rest always remain cool. But when keeping the notebook on your lap, it may become uncomfortably warm (especially in the summer). (±) The average temperature of the palmrest area of similar devices was 29.1 °C / 84.4 F (+1.2 °C / 2.2 F). Apple's speaker system has not changed, the keyboard flanked by two stereo speakers and a subwoofer (2.1), which uses unibody case as a sound box. The sound quality is fairly good but you shouldn't expect too much. 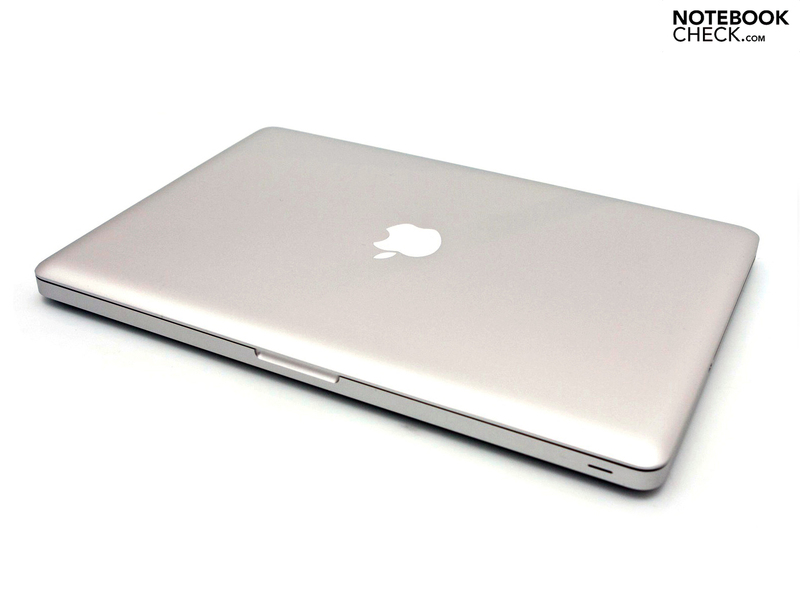 Compared to the MacBook Pro 13, there's a clear difference to be heard, however. It's noticeable even when you hear the system noises. The built-in omnidirectional microphone is located once more below the grid of the left speaker. The quality of the recorded sound via Skype or FaceTime seems fairly good. On the left side of the case is the 3.5 mm headphone jack for hooking up an external sound system. Analogue as well as digital signals are supported. Listening to external speakers hooked up via the headphone jack, the sound seems clear and undistorted. Another possibility is attaching an HDMI adapter to the Thunderbolt/MiniDisplay port, since HDMI cables can carry an audio as well as a video signal. New and faster hardware doesn't necessarily have to use up more energy. The Intel Core i7-2635QM in place here has a thermal design power (TDP) of 45 watts. The power consumption level does, of course, get adjusted depending on the intensity of use and the clock rate of the CPU. The clock rate can reach as high as 2.9 GHz using the Turbo Boost 2.0 function—and as low as 798 MHz in idle mode—both of which influence the amount of energy consumed. However, enabling the Energy Saver can bring about a longer battery life. 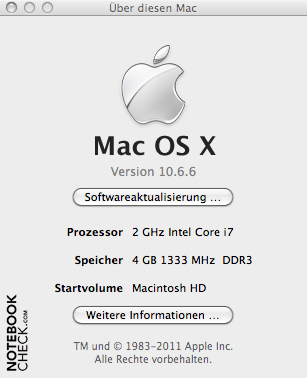 In idle mode under Mac OS X, the power consumption fluctuates between 10.6 and 18.2 watts. The previous MBP from 2010 consumes just a bit less. In Microsoft Windows 7, our test laptop eats up 26.4 watts (idle), making it more efficient here than the 2010 model (27.6 watts). Under heavy use, not only is the CPU at a higher clock rate but the AMD graphics card is also active, bringing the energy consumption to 63.9 watts (Mac OS X). Despite its weaker hardware, the version with Intel Core i7-620M and Nvidia GeForce GT 330M eats up about 10 watts more (75.5 watts). Things get interesting in Windows 7. The high power consumption value of 90.4 watts under heavy use shows that the laptop is not optimized for Windows because this value exceeds the power supply's capacity. 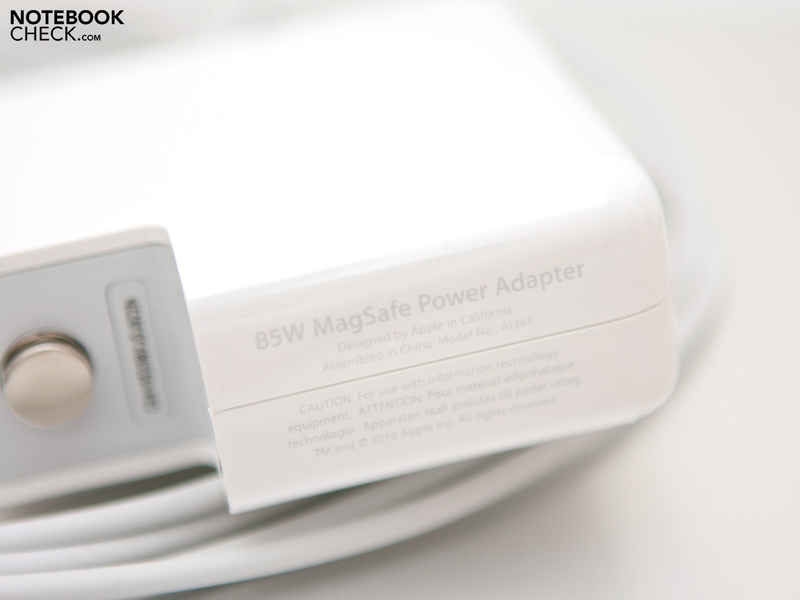 The MagSafe Power Adapter is meant only to supply up to 85 watts, which would explain the CPU throttling when using Windows (see "Peformance">"Throttling" above). On top of that, charging the battery only raises the already too-high power consumption value, leading to a greater overload of the power supply. A lithium polymer battery with a capacity of 77.5 Wh (10.95 volts) has to bear the brunt of the hardware's high power consumption when the laptop's unplugged. 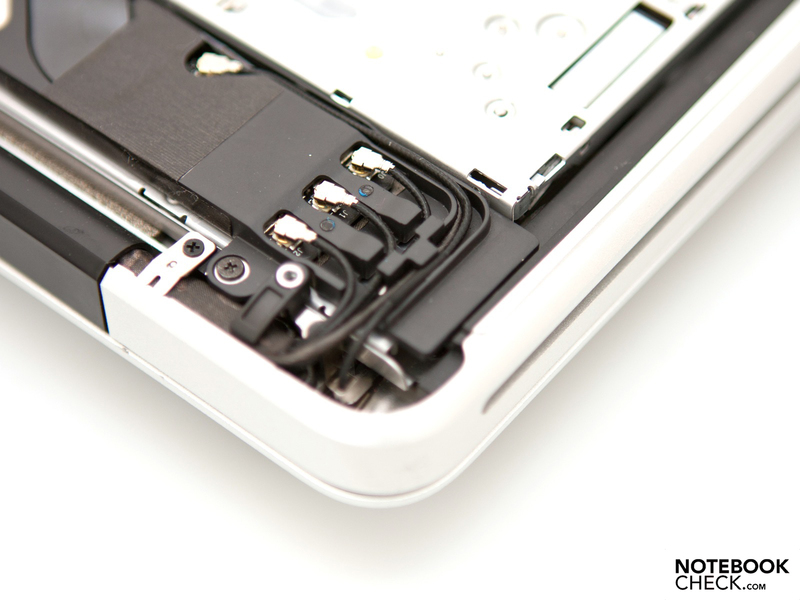 One of the downsides of Apple's unibody case design is the built-in (technically non-removable) battery. 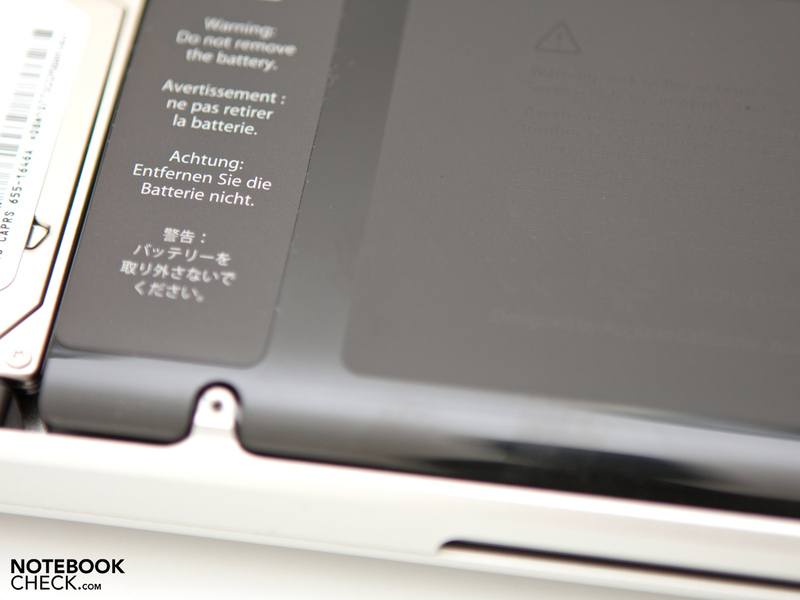 According to its label and the terms of the warranty, the battery should only be removed or swapped by either Apple or its certified partners. There are some claims that Apple has improved their means of testing battery life and that the new MBP has a 7-hour battery life under "realistic conditions". In order to most accurately measure the battery life, all tests were performed under Mac OS X except for the stress test (Windows 7). We first simulated reading a text file using some Mac OS scripts with minimum screen brightness, keyboard backlight off and Wifi/bluetooth deactivated. After an entire 10 hours 43 minutes, the computer shut off. Compared to the max battery life of the previous MBP, we see that the new hardware has not affected the battery life much, only 41 minutes. The min battery life is another story, however. Here, it's completely justified to use the Classic Test from Battery Eater (Windows), because similar values have been measured under Mac OS X. With maximum screen brightness and keyboard backlight, Wifi on, the battery dies after a mere 53 minutes. It's no surprise since voracious quad-core CPU eats up so much power. 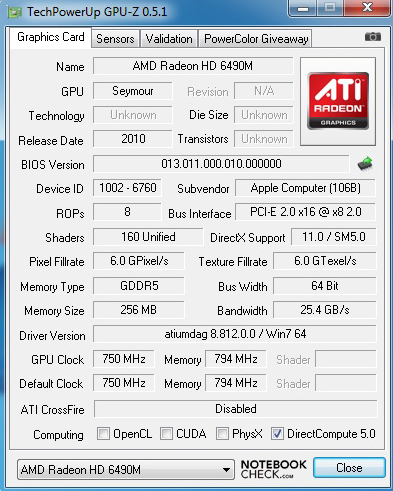 The model from 2010 with Nvidia GeForce GT 330M and Intel Core i7-620M held out for 1 hour 38 minutes in this test. Using another Mac OS X script, we browsed the internet via wifi with fair screen brightness and automatically adjusted keyboard backlight. The resulting 8 hours 14 minutes even exceed the battery life advertised by Apple. With maximum screen brightness, we end up hitting Apple's measurement of 7 hours, which really goes to the credit of Apple for advertising a realistic battery life. When playing a DVD film, the notebook runs on battery power for 6 hours 27 minutes, enough for about 3 feature films. The previous MBP is bested by a narrow margin here. The more powerful processor in the new MacBook Pro leads to a significantly lower minimum battery life in our test notebook. 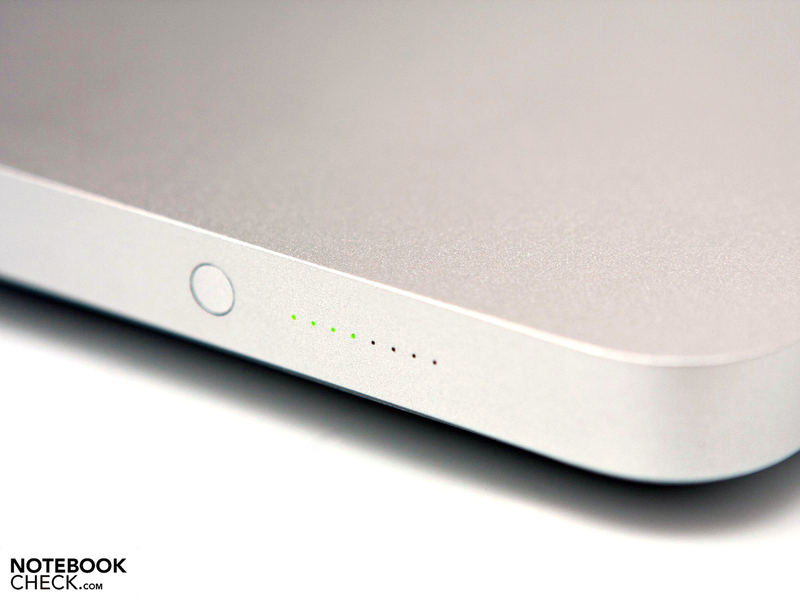 When watching a DVD, browsing the internet or leaving the laptop idle, the battery life is really very long. 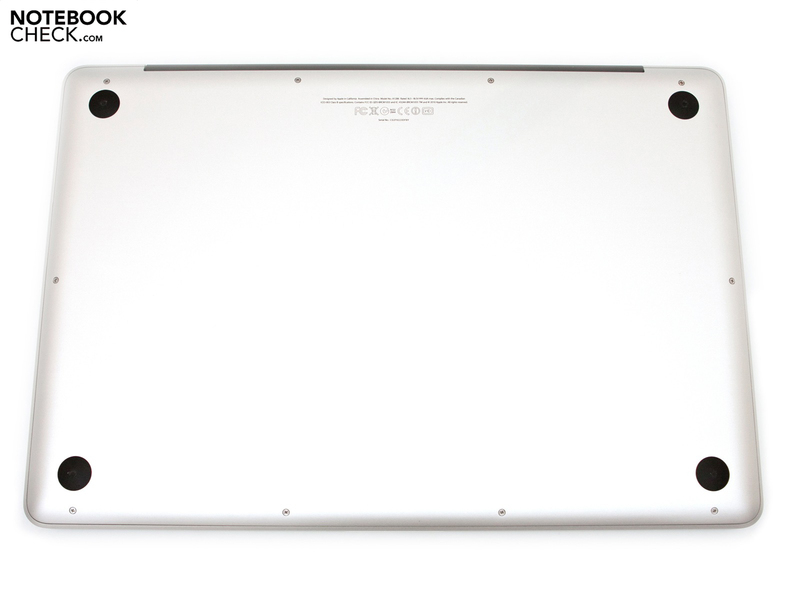 The fourth-generation MacBook Pro 15 Early 2011 has a sturdy aluminum unibody case. Some people's demands for a new case design have not yet been answered, but Apple's craftsmanship, design, sturdiness and comfort of use are some powerful selling points of the laptop. Some Windows notebooks have tried in vain to imitate these qualities, which makes Apple rather justified in re-using this same design. Like with its predecessor, the focus of this update is new, more powerful hardware. The version we reviewed with Intel Core i7-2635QM quad-core processor shows a big improvement in performance compared to the previous version. The dedicated AMD Radeon HD 6470M—including graphics card switching technology— and on-board Intels GMA HD 3000 in the entry-level model can't quite outdo the performance of the GT 330M / 320M of the previous MBP. Laptops with similar performance and Microsoft Windows are a good deal less expensive. The new MBP scores some more points with its the speedy S-ATA III hard drive connection (SSD, 6 GBit/s) and the Thunderbolt port. These two features are, however, very new have yet to prove their effectiveness. 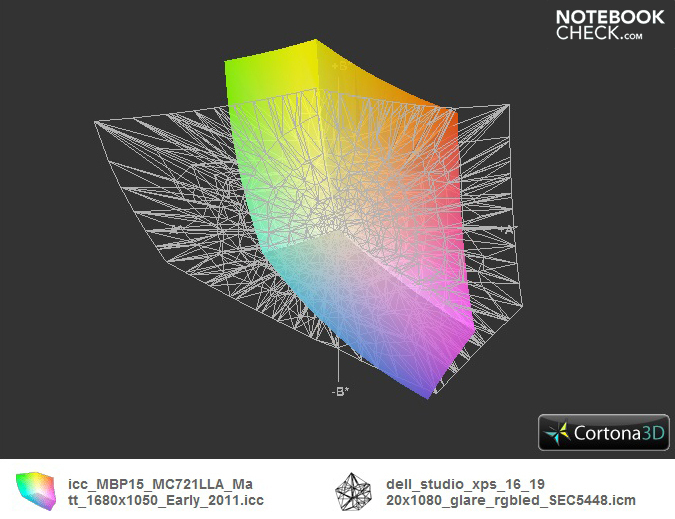 There's also the option of a matte hi-res screen with a native resolution of 1680 x 1050 pixels. The additional 150 Euro for this is honestly worth it, considering the good contrast, screen brightness, better usability outdoors and lower overall weight, especially with summer approaching. The system noise and case temperature were, however, a bit worse than the previous generation due to the powerful processor. When using Windows, the CPU reached as high as 100°C during our stress test—combined with the small, overloaded power supply, this leads to throttling of the CPU. 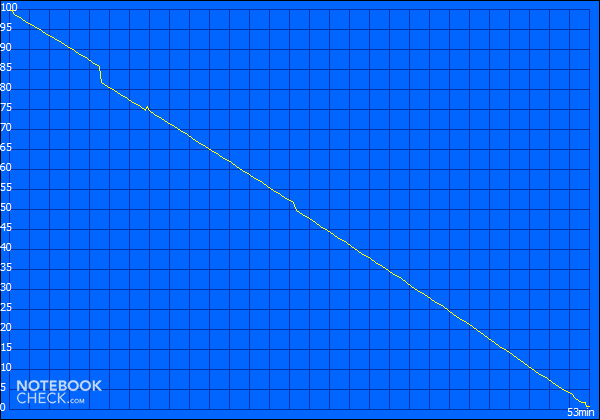 Under real-world conditions, though, only very demanding games (like Bad Company 2) might lead to automatic downsampling. Other than that, we did not experience any CPU throttling under Mac OS X or Windows in the course of testing. 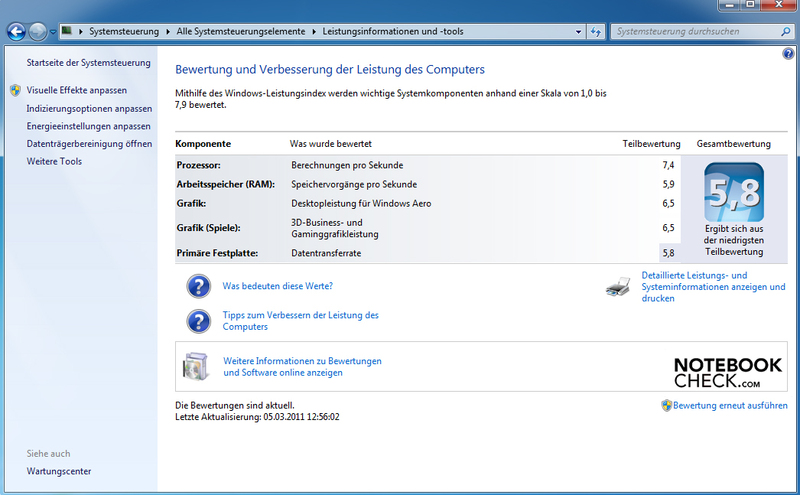 The starting price of 1749 Euro (RRP, glare-type, 1400 x 900 pixels) remains the same despite the new hardware, easily placing the notebook in the premium segment. The hi-res screen version will run you about 1899 Euro. The short 12-month standard warranty and the shamelessly expensive extended warranty can be a source of frustration. Optional: the matte hi-res display with a 1680 x 1050 pixel resolution. 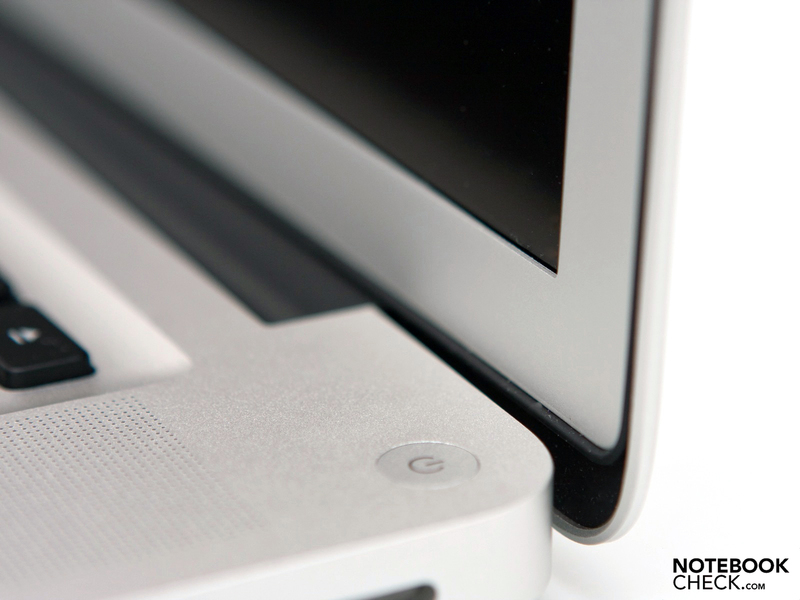 The centered display lid hinges hold the screen tightly in place. A new feature is the FaceTime HD webcam (720p recording quality). The entire base plate can be quickly removed. At first glance, the inside looks the same as before. 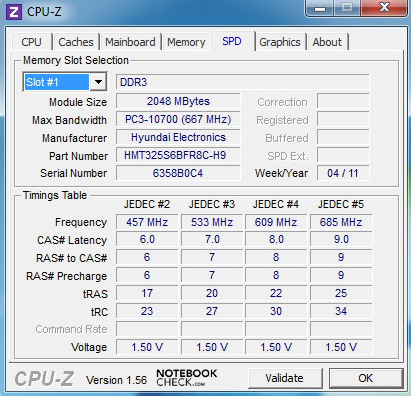 But the memory now runs at 1333 MHz, no longer 1066 MHz. The 2.5" is held tightly in place away from other hardware. The wifi card is attached to three antennae. In between the fans we find the CPU and GPU. The lithium polymer battery with a capacity of 77.5 Wh and cannot be removed. The 2.1 sound system makes for some good sound quality. And the large glass touchpad leaves nothing to be desired. ... once again appears in the form of the aluminum unibody case. The exterior consists of a single chunk of aluminum. ... as well as the feel of the aluminum surfaces are all excellent. ... like the new combination port, called Thunderbolt. The battery power indicator remains along the left side as before. The keyboard and touchpad remain the same. 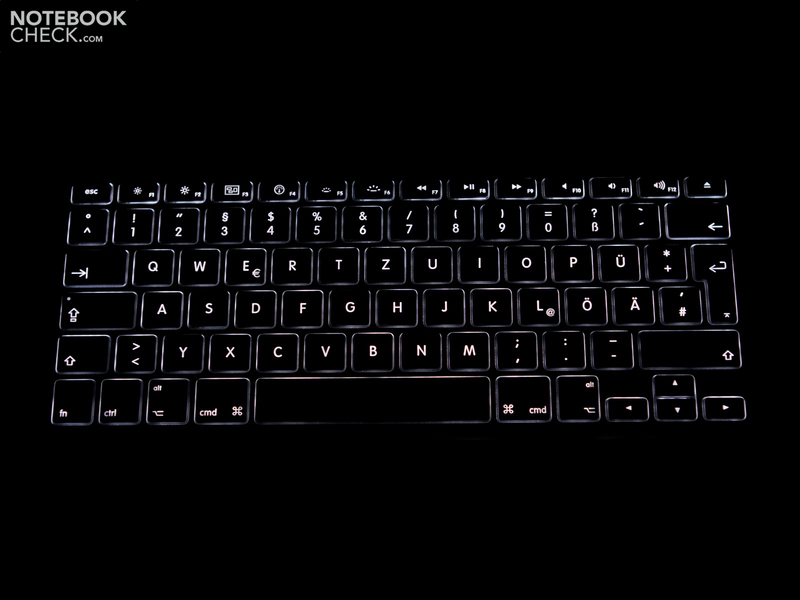 ... with a keyboard backlight, nice! The 85-watt power supply is optimized for use under Mac OS X. The once-again perfect aluminum unibody case, the timeless design and Thunderbolt port, although there aren't many devices that can be connected with it yet. A lower starting price or longer standard warranty of at least 24 months. The extended warranty is shamelessly expensive. The time-tested case design is kept in its entirety with no options regarding what material the case consists of or the input devices. Because of the Sandy Bridge chipset defect, the release of comparable laptops is lagging. The successors to high-end notebooks like the Sony VAIO VPC-Z13Z9E or HP Envy 15 will make for some good competition once released.